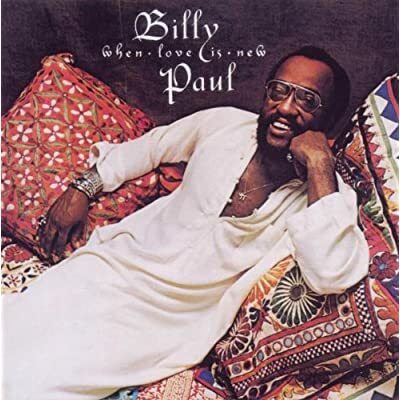 BILLY PAUL-WHEN LOVE IS NEW. In a previous article I wrote about one of Billy Paul’s best know albums Let ‘Em In. After his hugely successful 360 Degrees of Billy Paul, released in 1972, which helped make Billy Philadelphia International Records’ first male superstar, 1976s’ Let ‘Em In is one of his best known and most successful albums. However, the album that preceded Let ‘Em In, 1975s’ When Love Is New, is the album this article is about. It’s probably, Billy Paul at his most political and socially conscious on side one of the album. These first three tracks on the album People Power, America (We Need Light) and Let the Dollar Circulate are very different to Marjorie which closes side one of the album. These three tracks are a long way from Me and Mrs Jones, but demonstrate a side to Billy that many people might well be unaware of. The rest of the album sees normal service resumed, with Billy singing his heart out on three long, slow, tender ballads like the title track When Love Is New and Let’s Make A Baby. Although just seven tracks and thirty-seven minutes long, it features Billy Paul at his very best. When the album was released, it reached number seventeen in the US R&B Charts, staying in the charts for seventeen weeks. This album marked the end of an era, with this the last ever album to feature the original M.F.S.B., the legendary Philadelphia International house band. Not long after this, they quit the employ of Gamble and Huff, reconvening as The Salsoul Orchestra. So as well as allowing the listener to revel in the sound of Billy Paul, it allows them to bid a fond farewell to one of the best ever house bands, M.F.S.B. When Love Is New opens with People Power, a song with a message, one that asks the people to come together and make a stand, and help forge a new and brighter future for the US, still reeling after the resignation of disgraced President Richard Nixon. The track opens with a combination of chiming guitars, dramatic swirling strings, keyboards and drums before a flourish from the rhythm section signals both the entry of Billy’s frustrated and angry vocal, and a quicker, fuller arrangement. While Billy preaches about the need for unity and People Power, the arrangement unfolds to reveal a dramatic and dynamic driving sound, with the driving rhythm section, keyboards, chiming guitars at the heart of the arrangement while, percussion, grand swirling strings and blazing horns combining to match the frustration yet hope of the lyrics. Billy meanwhile, is accompanied by female backing vocalists, whose sweet and soulful voices unite, the perfect contrast to Billy’s much more powerful vocal. M.F.S.B. on this last hurrah for Gamble and Huff, provide a fast, powerful and emotive backdrop for Billy’s vocal, and the lyrics by McFadden, Whitehead and Castarphen. Together, the produce a powerful, potent and important message for the people of the fifty-one states. America (We Need Light) is a paean to the soon to be new political administration that would enter The White House in 1976, about the changes needed to get the US back on its feet. The introduction is funk laden thanks to the rhythm section and guitars, before the lush, strings sweep in accompanying a powerful and hopeful vocal from Billy. Here, the tempo is quick as the songs sweeps along, with the rhythm section, chiming guitars and sweeping strings mainly responsible for creating an uplifting, melodic sound that matches the hope in Billy’s vocal. Although deeply political and full of social consciousness, this is a brilliant track with one of the best arrangements on the album, one that matches Billy’s hopeful pleas. The third and final of the socially conscious songs on When Love Is New is Let the Dollar Circulate. When drums, bass chiming, shimmery guitars and blazing horns combine with grand strings during a lengthy and drama laden introduction, they’re just building up to Billy’s entrance. Eventually, he does, proceeding to sing about the economic woes of the US and how to rectify them, money must flow and circulate through the economy. As well as producing some excellent music, Billy offers free of charge, some interesting and insightful economic advice. His vocal is considered, a mixture of frustration and hope, as behind him, another fuller arrangement unfolds. It’s a combination of sweeping strings, clavinet, punchy rhythm section and braying horns. They create an arrangement that marches along to the beat of Earl Young’s drums for one last time. Adding to the fuller, compelling arrangement are the female backing vocalists whose softer voices provide a contrast to Billy’s clearly frustrated vocal. Like the previous two tracks, Billy delivers a message to the people, using the medium of some majestic music, reaching the ears of people who might ignore similar messages from the politicians who they no longer trusted. Closing side one of the album was Marjorie, a jazzy number, that seemed out of place following three such socially conscious tracks. It has a quicker tempo, floating along with a quaint old-fashioned sounding arrangement that brings to mind an era long gone by 1975. Having said that, it’s a catchy track, almost infectious that has you transfixed for its duration. Piano, rasping horns, lush strings and the rhythm section turn back time as does Billy, who reverts to jazz crooner, and carries it off with aplomb. The addition of subtle female backing vocalists, punchy, rasping horns, lush strings and bursts of drama from the rhythm section bring to mind a big jazz band, with its members in dinner suits as they accompany Billy. This is added to, when the tinkling piano enters, adding just the finishing touches to this very different and very good retro sounding song. It’s a nice way to end side one after the three political and socially conscious tracks. Opening side two, was the first of the three long, slow love songs When Love Is New. The tempo is slow, there’s a lushness to the sound and tenderness to Billy’s vocal. Strings lush and sweet enter, accompanied by a slow, subtle rhythm section piano and chiming guitars accompanying Billy’s gentle, tender vocal. There’s space aplenty throughout the arrangement, that sees horns gently rasping and the female backing vocalists as Billy sings about how it feels when love is new, and how after a while, love goes stale. Instead, he sings they must keep their love new, doing so thoughtfully and tenderly, accompanied by a beautiful lush and spacious arrangement that helps make this the best track on the album, one that’s utterly beautiful and up there with the best of Billy’s ballads and love songs. The second of the three love songs on side two of the album is I Want Cha Baby which opens with the sultriest of saxophones accompanied by a slow piano, chiming guitars and slow rhythm section accompanying Billy’s pleas to the love of his life. Strings sweep in, followed by a dramatic burst of drums and horns, with subtle, sweet female backing vocalists. This continues throughout what is a beautiful yet drama laden track, featuring another excellent arrangement and probably, the tenderest of vocals from Billy. He pleads and persuades his way through just over six minutes of beautiful dramatic and beautiful music, resorting to a half-spoken vocal as he tries to win the affections of his love. Quite simply, this is one of the most seductive tracks on the album, and should carry a government health warning. When Love Is New closes with Let’s Make A Baby, which, when it was released as a single reached number eighteen in the US R&B Charts and eighty-three in the US Billboard Charts. Again, Billy is at his persuasive best, pleading and attempting to woo his lover into making two into three. The tempo is slow, the sound spacious as keyboards, chiming guitars and rhythm section combine with Billy’s tender, seductive vocal. Lush strings sweep in and breathy female backing vocalists join in, helping Billy create a masterpiece in seduction lasting a lengthy seven minutes. Later, his vocal grows in emotion as he sings passionately about bringing another life into the world. Together with what was M.F.S.B. on their last appearance on a Philadelphia International album, Billy produces another brilliant track, rounding of a run of three beautiful, slow love songs with one of the best tracks on the album.